The Rho Ophiuchi cloud complex is a dark nebula of gas and dust located just south of the star ρ Ophiuchi of the constellation Ophiuchus. At an estimated distance of 130-ish parsecs (about 430 light years) this nursery is one of the closest star-forming regions to our solar system. It is also one of the most colorful areas of the sky because the nebulae surrounding Rho Ophiuchi display a wide range of cloud phenomena. Rho Ophiuchi, a bright triple star, is surrounded by the blue reflection nebula, IC 4604. The blue star Sigma Scorpii is surrounded by an intense red hydrogen emission nebula. Adjacent to Sigma Scorpii is the large globular cluster M4. Despite its apparent association with the surrounding nebulae, M4 is actually a much more distant background object at about 7200 light years away. A second globular cluster hidden in the nebulosity around the red supergiant, Antares (meaning “rival of Mars”), NGC 6144, is also a background object at 33,000 light years away. Antares is so large that, if it were at the center of our solar system, its outer atmosphere would reach to the orbit of Jupiter. Antares strong stellar wind has created the relatively cool yellow nebula, IC 4606, that seems to engulf the star and obscures NGC 6144. 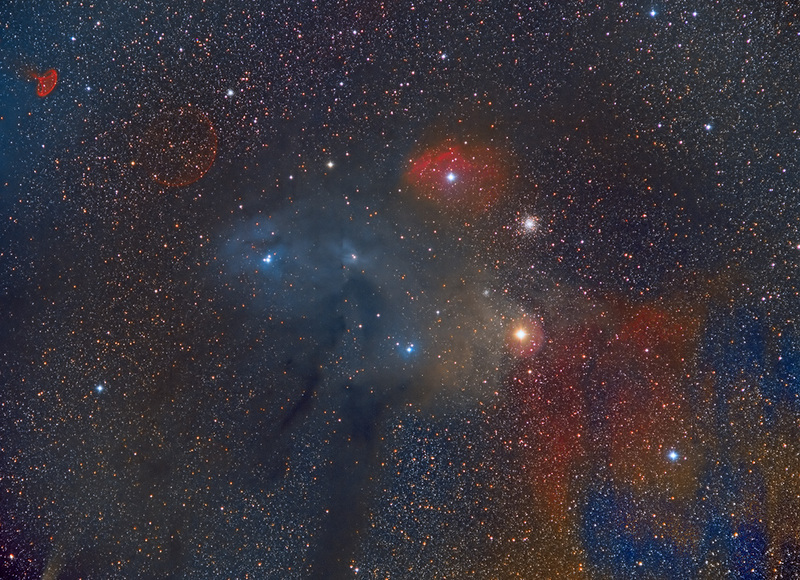 The blue reflection nebula, IC 4605, next to IC 4606 is reflecting the blue light from the star it surrounds. Part of the the dark nebula, B44 (commonly known as “The Dark River”), is seen spilling through the complex. This nebula is created from dust that is in front of the surrounding nebula and causes us to see it in silhouette.